Transform limp locks with the Aveda Pure Abundance Shampoo, Conditioner and Thickening Tonic Trio, a gift set that’s bursting with body-boosting ingredients and uplifting scents. 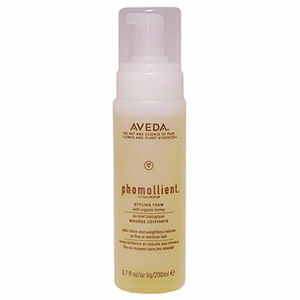 The shampoo, conditioner and thickening tonic work together to add volume and vitality to every strand. 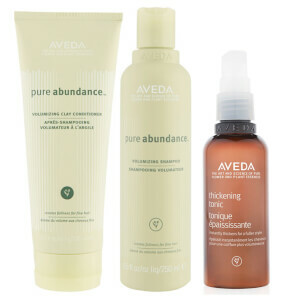 Add fullness and definition to fine hair with a nourishing shampoo that uses a natural, plant-based formula. Kaolin Clay and Acacia Gum combine to boost body and volume, while Jasmine and Peppermint provide an uplifting scent that lasts throughout the day. Harness the power of Kaolin Clay to thicken, volumise and boost hair from root to tip. Also containing nourishing Acacia Gum from Africa, the conditioner softens and strengthens strands to add body and life. Transform limp, lifeless locks with a powerful treatment that works to boost volume from root to tip. Packed with botanical ingredients including certified organic Amla Fruit, its 97% naturally derived formula is ideal for thinning and damaged hair, allowing you to achieve a fuller, denser appearance after just one use. Tonic: Spray on thickening tonic thoroughly from roots to ends, in sections. Comb through to distribute evenly. Blow-dry your hair with a round brush, using a nozzle to direct the air down each section. Brush your dry hair into the style you want.